Este pequeno grupo de cerveja e passeio de bicicleta de São Francisco apresenta uma variedade de bairros exclusivos, com paradas em três bares locais ou cervejarias ao longo do caminho. Desfrute de cervejas artesanais (primeira cerveja incluída) e descubra a história cultural de cada área característica, incluindo a SOMA, o Arts District de São Francisco e o peculiar Mission District. Os números são limitados a 12 pessoas para uma experiência mais personalizada com o seu guia informativo sobre este passeio de lazer. Este pequeno grupo de cerveja e passeio de bicicleta em São Francisco começa no coração de Chinatown. Encaixe seu capacete e pegue sua bicicleta, depois parta para uma excursão por São Francisco. 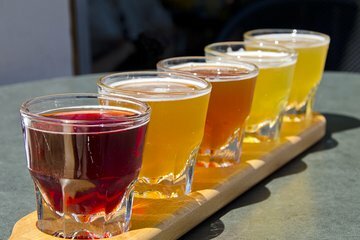 Seu guia o acompanha até três cervejarias populares, pubs, bares ou cervejarias para experimentar diferentes cervejas artesanais; sua primeira cerveja está incluída, com oportunidades de comprar mais cerveja e comida em outras paradas. Siga o seu guia até o próximo Mission District, talvez parando no 21st Amendment Brewery ou ThirstyBear Brewing Co no SOMA ao longo do caminho. Pedale passando por uma mistura de restaurantes da moda e murais ecléticos na Missão, visitando várias cervejarias artesanais, como Southern Pacific Brewing Company ou Zeitgeist. Junte-se aos moradores locais e aprenda sobre a história e a cultura de São Francisco enquanto seu guia destaca as características definitivas de cada bairro. Termine sua excursão com um loop pela Union Square e desfrute de um passeio panorâmico até seu local de partida em Chinatown. My parents, boyfriend and I all embarked on this journey and it was so much fun! The breweries were great local spots and cruising around the city on bicycles gave us a different perspective. I was a little nervous because of the hills, but the route was generally flat and was very bike friendly. Our host was very knowledgeable as well and we learned a lot of fascinating tid-bits about S.F. 's early days. We had a terrific time and would absolutely recommend for anyone who likes beers, bikes and city walks! Cheers! This tour was amazing. The greatest tour I've ever taken. It was SF beer week which made it even more enjoyable! Highly recommend! Great way to experience San Francisco, and some of the best breweries in the city. Our tour guide, Danny, was knowledable, interesting, and kept our group moving throughout the streets safely. If you're looking for a memorable way to see San Francisco, this is highly reccomended. 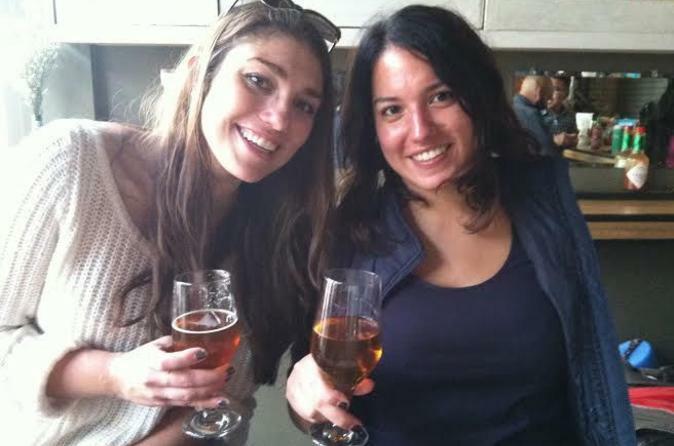 Great way to see San Francisco and experience some of the local craft beers. San Francisco is bike friendly with bike lanes throughout the city. Our guide Hunter was great, safety and having fun definitely a priority. Overall, fun trip/tour. But, while you get to see the city, you don't just go to local breweries. One was just a local bar and you could smoke there, so it was very sickening to me. The riding was super slow. I respect traffic laws, but it was too slow. Then we were an hour late returning, which caused problems for my evening travel. Fun experience. Had beers with our new tour friends. We didn't want it to end. Christina was great. The guides were so nice. The bikes were great. We met great people and saw parts of San Francisco that we wouldn't have seen otherwise. Venecia was an amazing guide. She gave us a rundown of each of the areas we were riding through and offered great recommendations to places to hit up. The tour was easy to do and super fun. The three places we hit were Local Brewing Co.,Cervecería de MateVeza and 21st amendment. Each one had a fantastic selection of brews and the empanadas at MateVeza were killer. Would highly recommend to anyone. This was an awesome tour with even better guides!! I am a native San Franciscan and I've always been so scared to ride a bike through San Francisco, but Ari and Gabe made me feel very safe. I couldn't believe myself riding down Market street, not at all nervous. We made a couple stops, learning about the neighborhoods and cool architecture throughout the city. I had no idea Mission Dolores was the oldest building in San Francisco! Besides the informative bike tour around the city, we stopped at really cool breweries that were surprisingly new to me - my favorite was Cervecería de MateVeza, a really small microbrewery in between Dolores Park and the Castro. They had a delicious variety of house brewed beers and savory empanadas. I was in heaven! If you have the chance, DO go on this tour!! Such a fun outing! I'm local, but I have never biked in San Francisco and this was a great way to do it. Ari and Gabe, our guides, did a great job navigating us along busy streets and made me feel safe about biking in busier areas like SoMa and the Mission. We started at 21st Amendment and they treated us to beer there, and then we traveled along a flat route to the Mission. Between stops, we got to check out all the incredible murals in Clarion Alley, and I even learned some fun facts that I didn't already know about the Mission Dolores and Dolores Park. My favorite stop was at a bar on the edge of Dolores Park, technically in the Castro, where I had an amazing locally made empanada and Yerba Mate–infused IPA. So good! I definitely recommend this tour for adventurous beer lovers who feel comfortable riding city streets.